Ronald Alley in the 1982 Tate Gallery exhibition catalogue writes, 'Sutherland picked up this toad on the road home from Menton in 1958 and kept it in the bathroom in water, then drew it the next day. 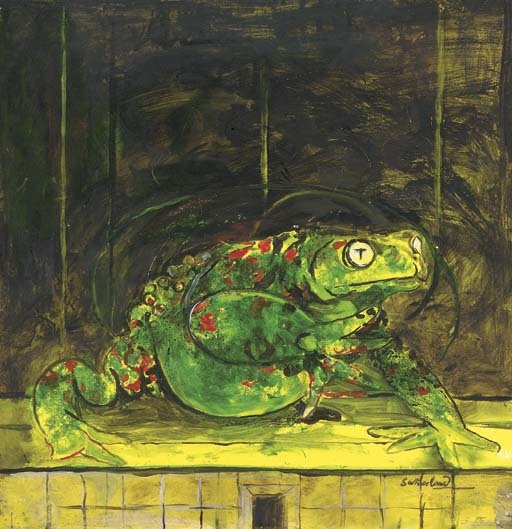 Before releasing the toad he had a series of photographs taken of it, including a couple more or less in the attitude of this work, and several more of it in a small glass tank which were used for his painting The Tank, of 1959. The present drawing relates to a series of lithographs, A Bestiary and Some Correspondences, 1968 (see lot 164).